At first, I thought it was going to be all dirt and worms (which I actually like ☺) but there are so many different directions this can go! Dinosaurs…buried treasure…gnomes & fairies…..I’m getting excited. We have ordered these jumbo inflatable dinosaurs and these dinosaur dangling swirls. The swirls will hang from the ceiling over the children’s check-out desk, and I’m not sure about the inflatable dinosaurs…but they were just too cool to pass up. 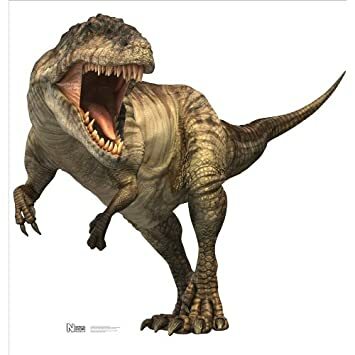 I seriously want this T-rex or this life-size standup poster, but they are a little pricey. A library near us has worm races each year (and they have a huge turnout!) It was the first I had ever heard of it, but we are going to try having worms races this summer at the library. Here’s a youtube video of worm races & here’s a youtube video about worm races from the Texas State Library. Make sure to have prizes for the winners! Did you know there is such a thing as a burrowing owl? I didn’t until recently. I couldn’t figure out why I kept seeing owls as related to the summer reading theme…I’m always learning something new! You could include owls as part of a theme on “burrowing animals.” And how cute is this burrowing owl puppet? Magic Treasure Rocks – This is by far one of the coolest ideas I’ve seen for buried treasure – from Growing a Jeweled Rose. These rocks are made from baking soda, food coloring and glitter. Hide a treasure inside of each rock and then bury them in the dirt. When kids find them, they spray them with vinegar and the rocks fizz and disappear, leaving the treasure! I want to do this! Seriously. Amazing. We have put together some great gnome and fairy storytime ideas for you, so make sure to check out our Gnome and Fairy Storytime Ideas Post! We’ve even created a rhyme and gnome flannel board template. I also think having one of these gnome doors in the library would be too cute. And for a craft we’ll have the kids make fairy gardens or terrariums. 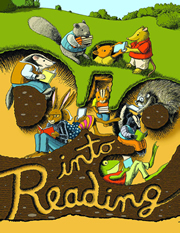 For more ideas, check out our Summer Reading Pinterest board! …..we are continually pinning new ideas! That’s all for now storytime friends! What do YOU have planned for summer at the library? February 10, 2013 in Everything Else, Toddler Storytimes.